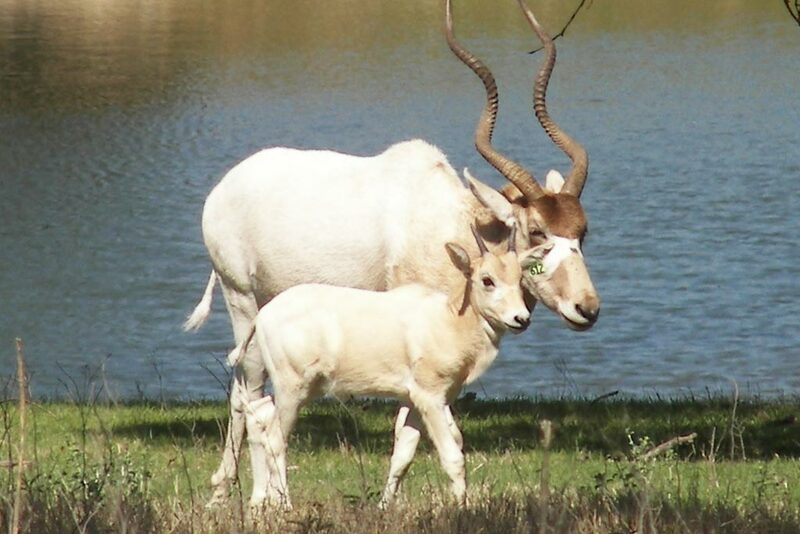 There are less than 100 addax in the wild. 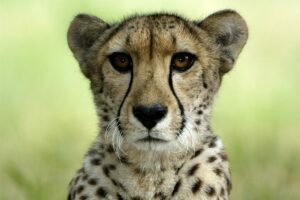 Formerly ranging over the entire Sahara Desert of Africa, four-wheel drive access to the desert and hunting with modern weapons has nearly eradicated the species. Other contributing factors are prolonged droughts and regional wars. 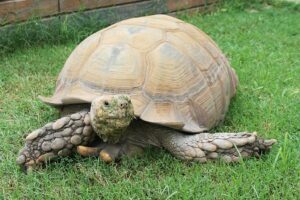 They are now restricted to isolated populations in Niger, Chad and Mauritania, as they suffer from poaching and disturbance due to oil exploration. This sturdy antelope is highly adapted to desert living. Addax have shorter legs than most antelope, which give them a low center of gravity and keep them steady – even on shifting desert sands. Their hooves are broad and rounded for sandy terrain. 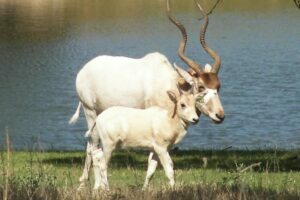 The summer coat of addax is white to reflect the sun’s heat, while their winter coat of darker tan absorbs the sun’s heat. They are nomadic, following the infrequent rains, and travel considerable distances in search of food. Wild addax are principally nocturnal and do most of their eating in the evening, while resting during the heat of the day. 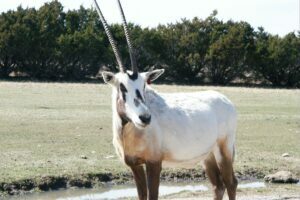 An addax can obtain all of its water from the plants it eats and by collecting dew off of the plants. In the mid-1980s, captive-bred addax from the Hanover Zoo in Germany were reintroduced to a park in Tunisia. 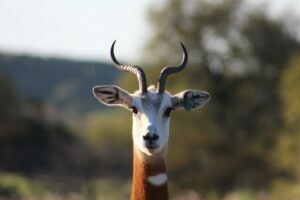 Being a founding member of the SSP (Species Survival Plan) for addax, Fossil Rim contributed animals in 2007 to the release program and completed extensive behavioral and DNA research projects that should benefit both captive and wild addax. 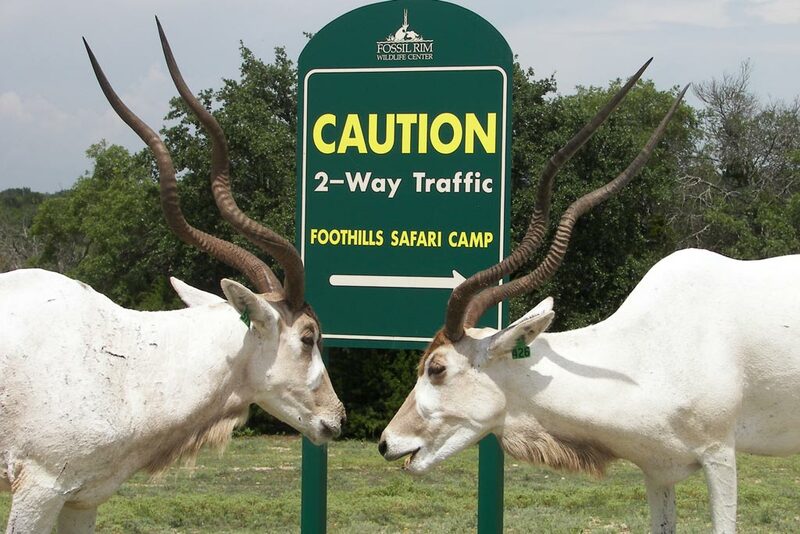 Fossil Rim had produced more than 600 addax as of 2016. Adults are easily spotted in the pasture by their corkscrew horns and characteristic dark toupees.